I’ve been making this Chicken Tikka Masala recipe for years, but recently adapted it for the slow cooker. It is SO GOOD. I may never go back! 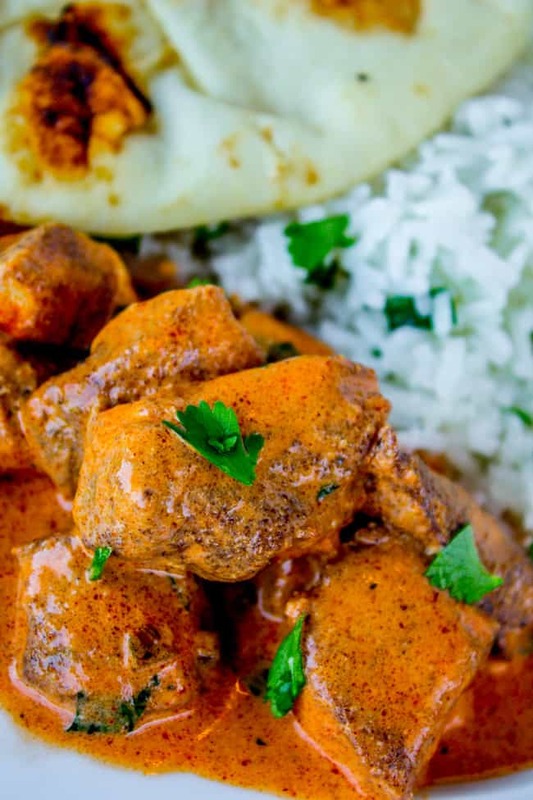 Tikka Masala is the one dish that I never get tired of ordering at Indian restaurants and this version is super easy and tastes restaurant quality. Do you guys have rules for how late you can text people? I mean of course it depends on who you’re texting. When I was growing up we didn’t make calls after 9pm. Is there texting etiquette these days? I’m always worried I’m going to wake someone up. Eric and I are night owls and sometimes forget that people go to bed at normal times. One time my brother called me at midnight just to see if I really always stay up like I claim I do. I answered right away of course. That same brother (who is also named Eric) went to college out of state in the same town that our uncle lives in. Our Uncle Ron had a habit of calling Eric waaaay too early in the morning. This was before cell phones, so when you call your nephew’s apartment at 6am on a Saturday, you definitely wake all the roommates up. Eric asked him not to call so early. So next time he called at 7am and still woke up the entire apartment. I would worry that someone might call me super early to get me back for texting them too late at night, but it wouldn’t even work because I would sleep right through it. This Chicken Tikka Masala is an old stove top recipe that I’ve been making for years. It’s a killer recipe. One time I made it for my friend Mir, who’s from Hyderabad, and he said it tasted authentic. He was probably just feeding my ego, but I don’t even care. This stuff is delicious. 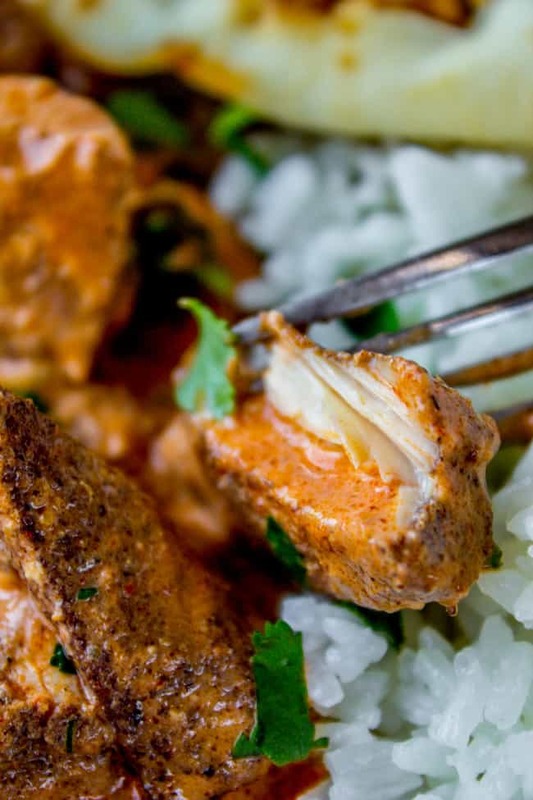 The thing about Chicken Tikka is that the chicken is supposed to be grilled, or broiled on high, or something that gives you that roasted-on-the-outside, tender-in-in-the-center flavor. But cooking chicken in liquid all day in a slow cooker isn’t going to give you that. Next time I try this I’m replacing the cream with coconut milk, or perhaps coconut cream. It will make the final flavor a lot sweeter but would make this recipe dairy free, (if you used olive oil instead of butter) which is one reason people like the Slow Cooker Basil Chicken in Coconut Curry Sauce. They’re always tagging in #whole30, and and I’m over here like don’t look at me, I’m just here for the carbs. Chop the chicken into bite size chunks. Add the chicken to the slow cooker. In a small bowl combine 2 teaspoons cumin, 1 teaspoon cinnamon, 1 teaspoon cayenne pepper, 1 teaspoon black pepper, and 1 teaspoon kosher salt. Sprinkle the spices over the chicken and use your hands to coat the chicken well. Sprinkle 1 and 1/2 tablespoons butter chunks over the chicken. Put the lid on and cook on high for 2-3 hours, or on low for about 5 hours. Add 1/2 tablespoon butter to a small frying pan. 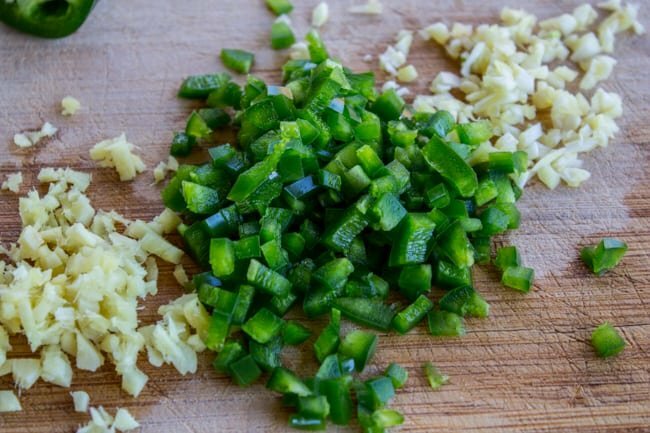 Add the garlic and jalapeno and sauté for 1 minute, or until fragrant. In a small bowl combine 2 teaspoons ground cumin, 2 teaspoons paprika, and 1 teaspoon kosher salt. 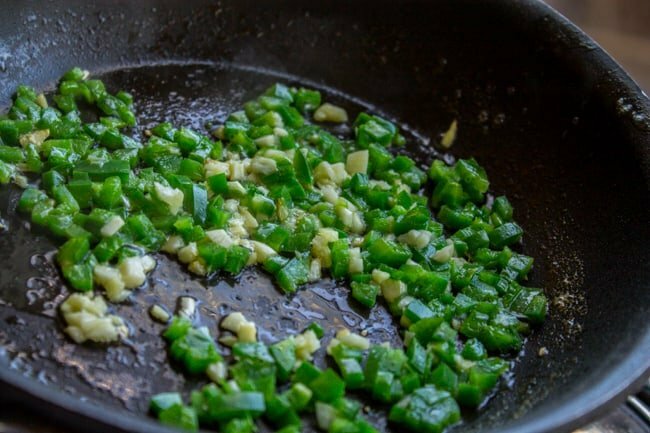 Add the spices to the frying pan and continue sautéing for one minute. Add 1 tablespoon lemon juice to the pan, stir it in and then remove from heat. Add this mixture to the crock pot. Add the minced ginger as well. Replace the lid and let cook on high for another 20-30 minutes or until thickened and bubbly on the edges. Taste it and stir in some plain yogurt. The amount is up to you. This makes it a little more creamy and also tempers the heat. Sometimes I don't add any, if I'm feeding kids I add more. 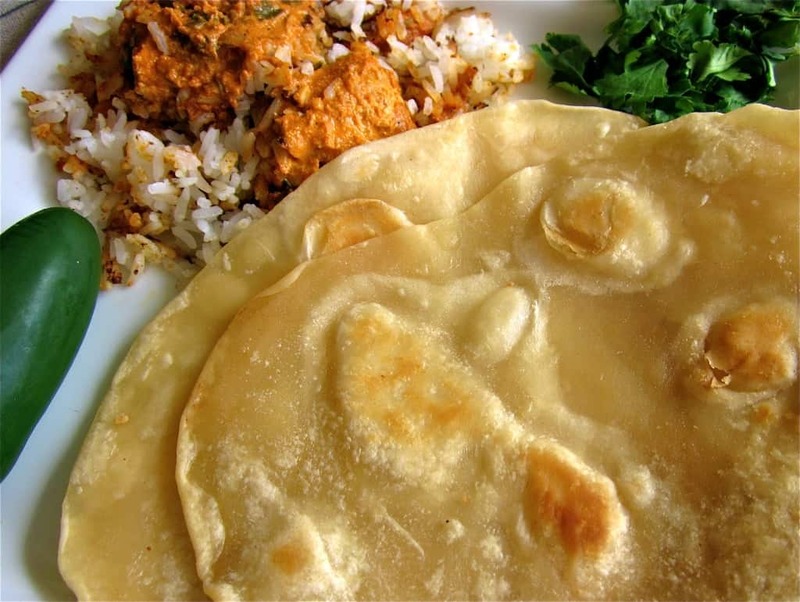 Serve with hot rice and naan. 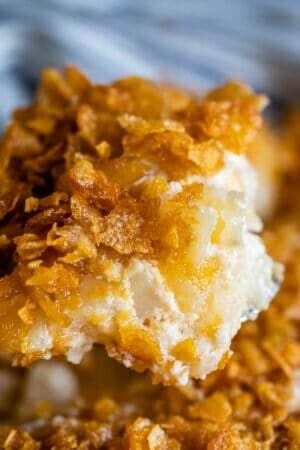 Here are some other recipes you will love! 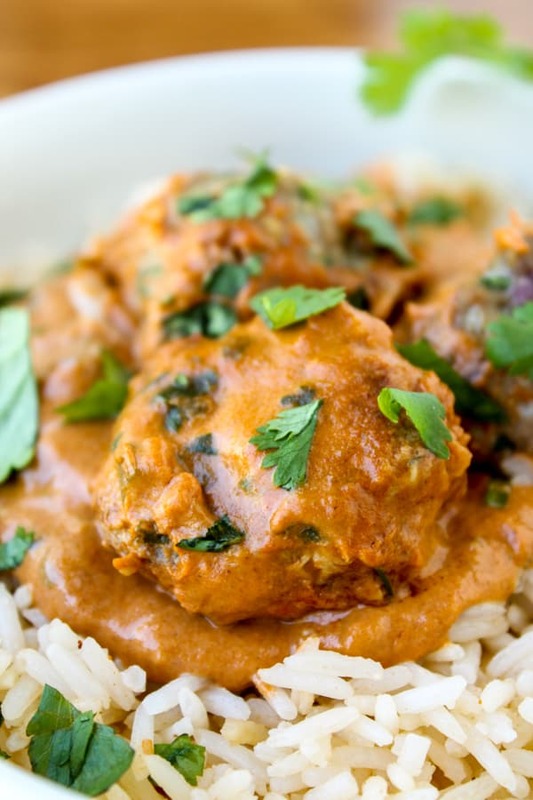 Chicken Tikka Masala Meatballs: made with ground chicken and the same sauce. Can you tell I’m obsessed with this dish?? 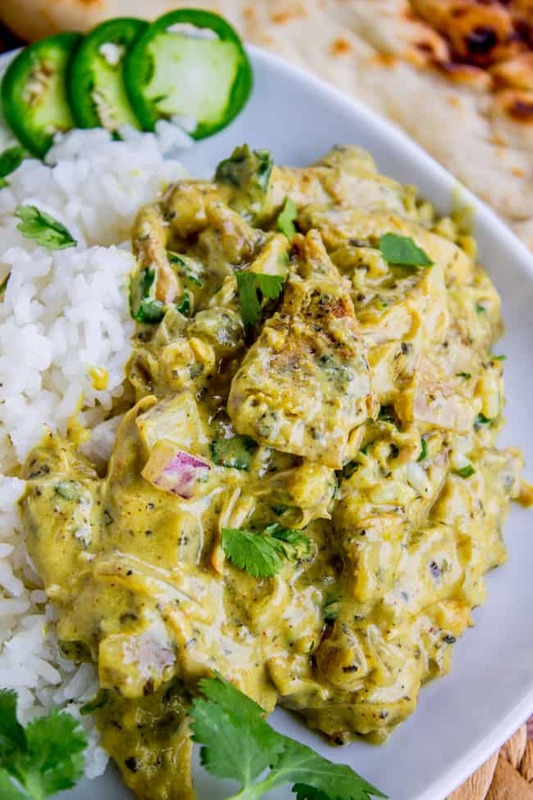 Slow Cooker Basil Chicken with Coconut Curry Sauce: << one of the top recipes on my blog! More Indian food from awesome bloggers! Hello, I have a concern. Is it normal for the chicken to be cooked through after 2 hours on low? It is still cooking but i am worried that the chicken will dry out or burn before dinner time.. what can I do to fix this..? Hi Ash, how did it go? The chicken will be perfectly cooked and crispy-ish on the outside. I just made this again the other day! It’s a favorite of mine. Hello! If I would like to double the chicken to two pounds, should I double the sauce as well? Thank you! Hey Veronica! Yes, if you are doubling the meat I would double the sauce! Enjoy! I made this last week for myself and my husband. We LOVED it. It was easy to make and absolutely delicious. My husband told me to hold on to this recipe, which means he approves! Thank you so much! What is the nutritional value? I’m looking for the carb count per serving.. Thanks so much! Looks delish! Hey Amanda! I don’t provide nutritional info for my recipes, but you can plug it into an online calculator! Google it, there are lots of free ones available. I hope you love the recipe! Holy cow this recipe was absolutely amazing. You’ve earned me as a fan for sure! Can’t wait to try literally everything else on your website. Thanks!! Hey Mia, yes! 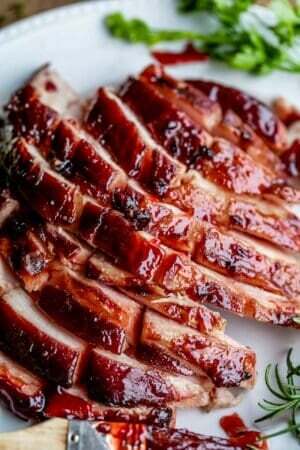 You can freeze it after it’s completely cooked in a ziplock for up to 3 months. 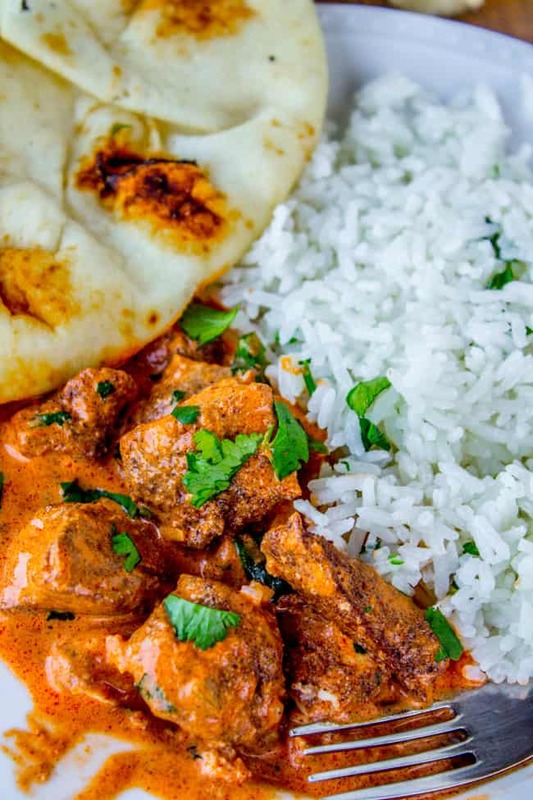 Can you tell me what kind of tomato sauce you use for the tikka masala? Or is it tomato paste? Going to make this soon, can’t wait! Hey Jelena! Great question! I used tomato sauce, here’s a link to the kind I used. Hope you love it! Thanks so much, I picked up the sauce at the grocery store this morning. Will make the dish later this week! 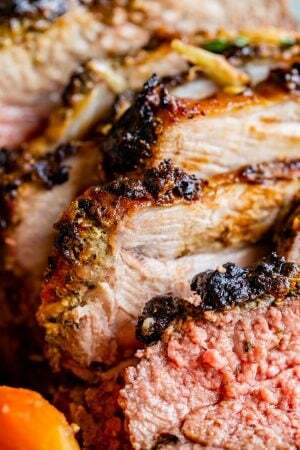 This looks so delicious with your pictures, but unfortunately it did not work in my slow cooker. I did everything according to the recipe, but the Chicken did not brown at all and was already very watery after the first 2 1/2 hours with only the spices and butter. I added the cream and tomatoes, but it did not want to thicken as well. And Yes i used the cooker on High. It passed already 4 hours, when i decided to stop cooking it. The taste was delicious, but not the texture. I guess i need to bake everything in the pan first and then transfer to the cooker. That is so strange Rosita! I’ve made this several times. Do you have an older slow cooker? I know sometimes they can get wonky if they are old. I’m sorry it didn’t work out! Hi! Do you think I could substitute half-and-half for heavy cream? Thanks! Yeah totally Katelyn! It won’t be as rich and may not thicken up as much, but it will still be tasty! Has anyone made this with beef yet? Would it work the same? Eager to try! Hey Megs! I’ve never tried it with beef, let me know how it goes! Beef = success! Added a bit more spice for the beef and did the first cook a little longer as the cubes of beef were about 1.5”. OMG who knew this first step would make foods so amazing!! Going to incorporate this method in more slow cooker recipes. Thanks so much. I’m glad I stumbled across your site. BTW it’s a good thing I tripled the recipe, it’s THAT good! 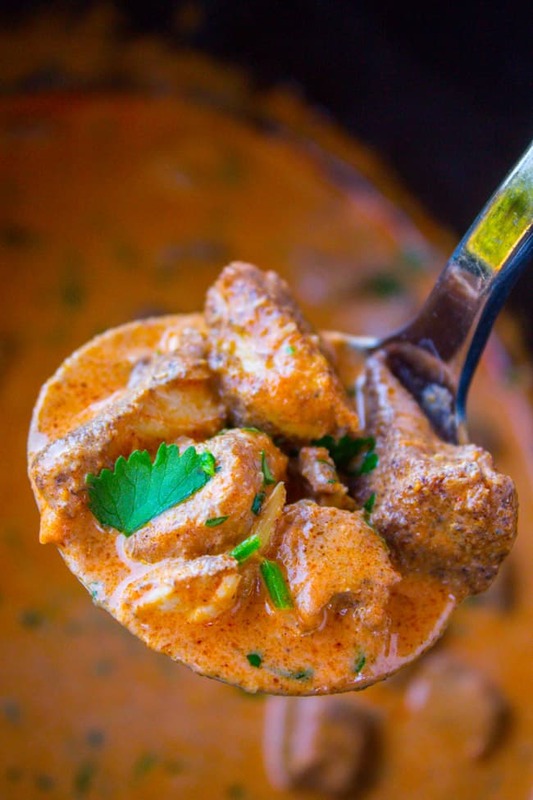 I love your basil curry chicken and am so excited to try this recipe! 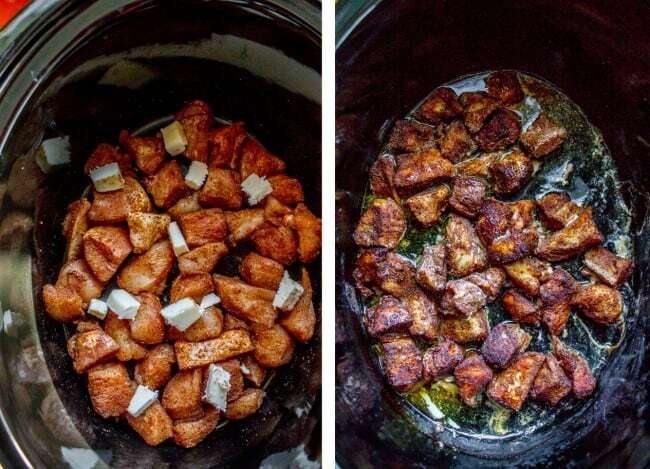 Do you think it would work well using chicken thighs instead of chicken breasts? Hey Kelsey! Funny you should ask that. I tested this recipe first with thighs, because I liked it so much in the Basil curry. But my husband and I decided that for chicken tikka, we liked to have distinct chunks of chicken instead of shredded. It changes the consistency of the final result quite a bit. I did it with whole thighs, then shredded post slow cooking. Maybe if you cut it when the chicken was raw you would get the same effect as the pictures above. For the record, I really liked it with thighs, but it didn’t feel quite the same as traditional tikka masala. Let me know how it goes! So according to wikipedia, Tikka Masala was invented in Scotland by a Pakistani or a Bangledeshi guy. You need to find somebody from the UK to help you comment on the authenticity of this dish haha. 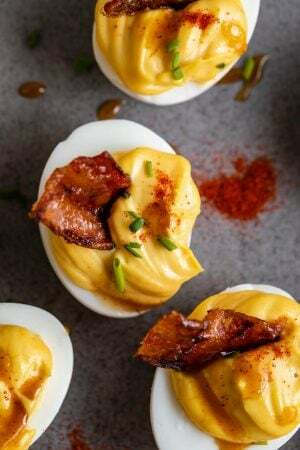 Oh man, as soon as I’m done nursing I’m making this first! We all went to our favorite Indian place around Christmas time. My dad cautioned me to get the mild instead of medium just in case. Even with little heat, my poor little man had a rash for days. Indian is one of my go tos for making dinner so I’m bummed. Our time and still is, no calling after 9:30pm or before 9:30 am. And no trampoline on Saturdays till 10 am. Oh man that’s such a bummer! I’ve never dealt with kids having allergies or problems with my milk (there’s just not enough of it :) But no spicy food! That would be so hard! Maybe you could make it but just leave out all the pepper? And no tramp before 10?? that’s how eric and I get to sleep in in the summers, haha! Trampoline at 7am…and earplugs. I am so glad this re popped up! I completely forgot to make it! It’s happening this weekend! I am soooo a night owl, I don’t understand people that are up at 6 ready to face the day!!! 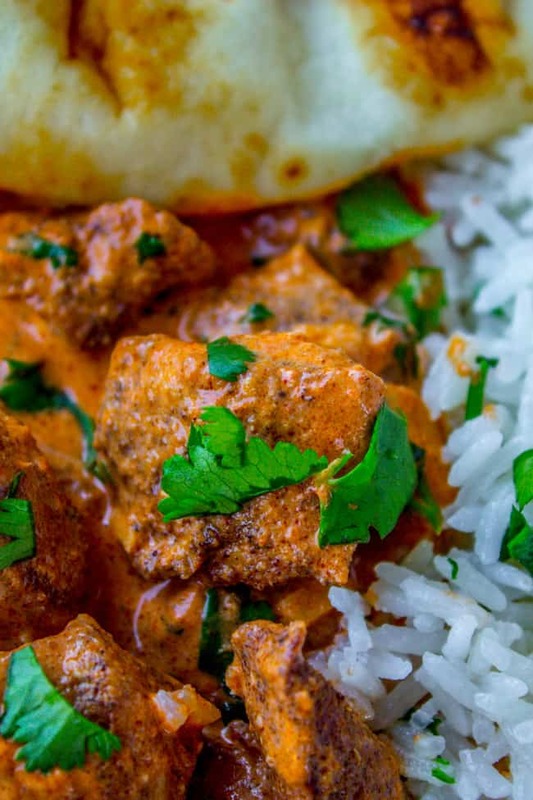 Chicken tikka is one of my favorites at the local Indian restaurant, this is a great technique!!! Me neither Mariana! Sometimes I wish I made an effort to be a morning person…but I would totally miss staying up late! when i was growing up, there definitely was a rule – not before 10am. (we were always up way before 10am but my mom in particular would be NOT PLEASED if she had to answer the door in her bathrobe and/or in the middle of breakfast because someone was incessantly ringing the doorbell to see if i could come out to play.) this was also back when answering machines were a.) a thing and b.) separate from the phone so the other thing that would drive my parents crazy is that my friends would call, but not leave a message, and just keep calling back. so you’d have to listen to the phone ring AND the answering machine pick up, play the greeting, and beep, rinse, repeat. …did i mention it was in our dining room? haha. fond memories! now i encourage anyone to use the do not disturb feature on their phone. i have mine set to come on between 1am and 7am, and still allow calls from “favorites.” so i won’t be woken up/bothered by a random text from a friend, but if either of my parents call or it’s a rare night my partner and i aren’t together and he calls, those will come through. (because at those hours it’s probably an emergency.) and of course it doesn’t affect the alarm. anyway long comments about phonecalls aside, this chicken looks so good! 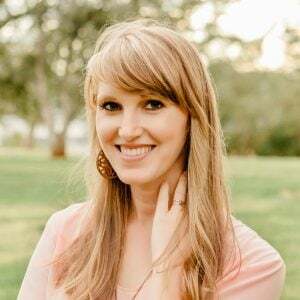 i love the idea of doing the sauce at the end – i have really gotten away from using my crockpot lately in favor of the dutch oven just because i don’t like all the liquid that comes from crockpot cooking. this is a really smart work around. Ummm that is genius. Morning restrictions seem way more reasonable to me than night restrictions! Because seriously if you show up at my house before 10am these days I WILL be in my pjs :) I should totally use that Do not disturb feature, that’s so smart. I didn’t know you could set it to still get calls from certain people! PS you need to bust out the crock for this one. for reals. Well, I know what I’m doing for dinner! Thanks! Awesome Judith! How’d it turn out?